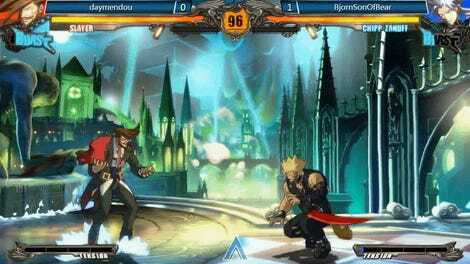 Over the weekend, Anime Ascension hosted several anime-styled fighting game tournaments. 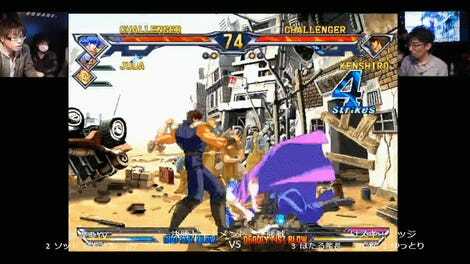 Although Persona 4 Arena Ultimax was was relegated to side tournament status in favor of newer games, its ending was one of the most exciting moments of the entire event. Based on the role-playing game of the same name, Persona 4 Arena Ultimax takes cues from its Arc System Works cousins with a number of similar gameplay mechanics, most notably instant-kill attacks that can completely erase an opponent’s health bar. They’re intentionally difficult to hit in a high-level match due to their power, but the Anime Ascension champion decided to wrap up the whole competition with one. 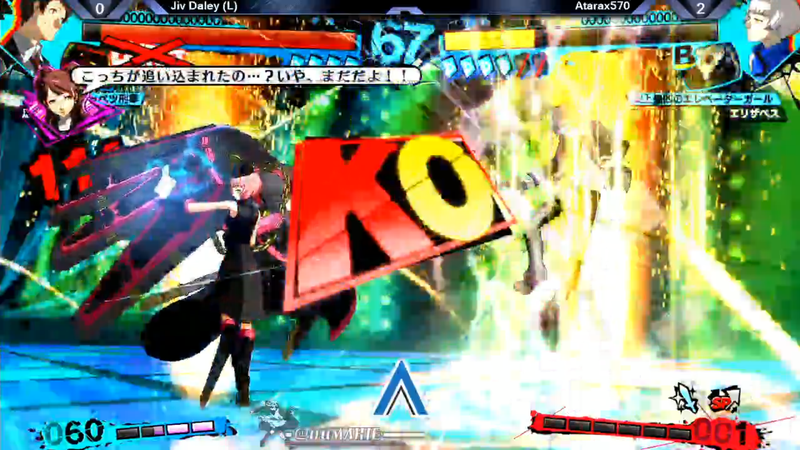 Atarax570 enjoyed a commanding lead as the Persona 4 Arena Ultimax tournament came to a close. Up two games and on the verge of winning the entire event, he looked to have some fun with his opponent, another strong player named Jiv Daley, in the deciding round. After activating his character’s instant-kill, it was just a matter of keeping the other player trapped in one location with a lengthy combo until it hit, securing the tournament in mind-blowing fashion. It obviously looks really awesome; what’s actually happening here is even more incredible. Atarax570’s character, Elizabeth, is arguably the weakest character in the game. Although she’s able to utilize system mechanics in unique ways, her low health, poor mobility, and lack of options after losing her Persona make Elizabeth a difficult choice for even the most experienced fighting game players. But when she’s on, she’s on, as Atarax570 demonstrated perfectly at Anime Ascension. Unlike other members of the Persona 4 Arena Ultimax cast who only have access to a single instant-kill, Elizabeth has three of these destructive attacks from which to choose. The most useful, Mahamaon, places a seal on the ground that completely depletes the opponent’s health should they still remain in its radius after the lengthy activation process completes. And while 12 in-game seconds can feel like an eternity in a fast-paced game like Ultimax, Elizabeth is uniquely equipped to keep enemies locked down should she have the requisite resources. The first step of Atarax570’s strategy is to gain enough meter to pull off the instant-kill setup. Since it was near the beginning of the match and neither player had much meter to utilize, Atarax570 incorporated the high-risk, high-reward Mind Charge super in the early parts of his combo. Mind Charge is a technique that drains Elizabeth’s life to put her into Persona 4 Arena Ultimax’s super-powered Awakening state, filling her super meter in the process. This gave Atarax570 the opportunity to meet the steep resource requirements of both Mahamaon and the additional super attacks he needed to keep Jiv Daley in the appropriate area. From there, it was just a matter of hitting the lengthy combo, watching the opponent’s near-full health bar drain, and collecting his Anime Ascension victory medal.